For the past two decades, more and more states have begun issuing concealed carry permits, and that legislation has generated a great deal of interest in firearms for personal defense. 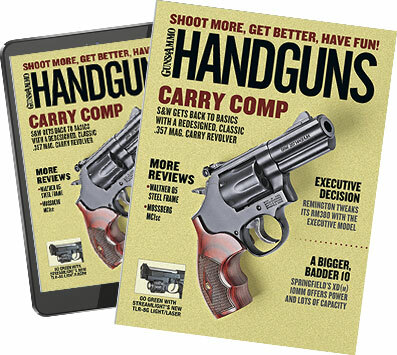 Today, most handgun manufacturers offer some type of compact firearm designed for concealed carry. Ammunition manufacturers are developing new and better defensive loads, and the market for comfortable, easy-to-conceal holsters has expanded greatly. There's also been an increase in the number of accessories designed specifically for concealed carry, particularly laser optics that are small enough and durable enough to serve daily duty on these compact handguns. Handgun lasers are not a new creation, though. Crimson Trace has been offering firearm lasers for more than 25 years, and there are a number of other brands producing compact, lightweight, affordable handgun lasers designed specifically for personal defense. But even as more shooters add laser products to their firearms, there are still a number of handgun owners that aren't on board with the latest laser craze. Crimson Trace's Kent Thomas likens this to the period before scopes were considered standard equipment on hunting rifles. "Despite the fact that optics for rifles have existed since the early 1800s, it wasn't until the late 1960s/early 1970s they became 'adopted' to make the user more accurate," says Thomas. "Today, the consumer would never buy a hunting rifle (unless it is a brush gun) without putting a scope on it due to the clear advantages they offer. Scopes are now 'standard equipment.' We believe that no personal protection firearm is fully equipped without a laser sighting system. Laser are standard equipment for all personal protection firearms." If lasers are to become standard on defensive handguns it is important to understand the advantages that they offer. When they were initially introduced, lasers were viewed by many shooters as a gimmick, a novel addition to a gun that did little more than add weight — one more thing to worry about in the midst of a life-or-death struggle. In truth, lasers are useful tools designed to enhance your ability to shoot accurately in various lighting conditions and in the most stressful situations. Whether you're a fan of lasers or not, here are five reasons why a laser makes sense on your defensive handgun. On a recent trip to Crimson Trace's Oregon facility, I had an opportunity to shoot a series of targets in their indoor range. For the first part of the experiment, I fired at targets in full light using a Glock G21 with and without a laser optic, and my overall accuracy remained much the same whether I was using the laser or not. But with the lights dimmed even slightly, the laser offered a huge advantage. Whereas I was struggling to align iron sights in those poor lighting conditions, the green laser offered instant target acquisition and my accuracy in the darkened tunnel was far better when the laser was activated. And, since dangerous encounters often occur in dim light, that's a major advantage. "Lasers are helpful sighting tools for many reasons, such as low light conditions," LaserLyte's Dusty Gibson said. "Equipping guns with lasers gives you the confidence in knowing exactly where your shots are going to impact." Additionally, lasers simplify the aiming process for those who have trouble viewing standard iron sights, another major advantage. The vast majority of shooters that regularly practice with their defensive firearm do so from a standard shooting position—standing up, balanced, with both hands on the firearm. Unfortunately, in a real-life shooting situation you may not have the luxury of shooting in this manner. It's entirely possible that you will be injured or will have to shoot on your back, lying on your side, or from behind cover, and in the worst situations you may only be able to use one arm. Regardless of body position relative to the firearm, the laser offers you the ability to aim and fire accurately. Gibson says that being able to shoot from these awkward positions is critical to surviving a lethal encounter, and lasers allow you to accomplish this. With a laser in place, you don't need to align your eye to the sights to shoot accurately at moderate ranges, a huge advantage if you find yourself on the ground or in some other compromised position. In those circumstances, lasers allow you to stay in the fight. During a violent confrontation, it is important to remain focused on your target, and lasers allow you to do so. There is no need to align your sights, since your sight picture is on the same plane as your attacker. In a dangerous situation, you want to be able to devote all of your attention to the threat. "All you need to do is look at the threat and align the laser dot," Crimson Trace's Mike Faw said. "There's no looking at your hand for the gunsights, and then the front blade sight, and then back to the target or threat." "Lasers allow for greater situational awareness and both eyes open shooting so you can focus on delivering accurate shots and properly addressing the situation." Lasers used to be bulky, heavy items that required a custom holster. Today, however, companies have managed to streamline holsters and provide longer battery life and better durability in smaller, lighter packages. "With the expansion of concealed carry laws and reciprocity, the influence of carrying small guns is greater than ever," Gibson said. "LaserLyte has found innovative ways to attach lasers to small guns that have never been equipped with lasers before." Modern lasers are lightweight, oftentimes weighing less than an ounce, and their waterproof exterior designs make them resistant to water and moisture from perspiration. For years, building green lasers has been especially challenging due to the added components required to produce a green beam, but modern engineering has allowed laser companies to produce green lasers that are compact and affordable, offering a viable alternative to the standard red coloration. In addition, modern lasers are more instinctive, meaning that when the gun is drawn the laser activation pad is situated so that the finger automatically activates the optic. This eliminates the need to look down at the gun or adjust hand position to activate your laser. Some lasers even offer automatic activation when the gun is drawn from the holster, eliminating the need for an activation pad altogether. Holster manufacturers have gotten on board with the demand for lasers, and now you can purchase holsters that are pre-fit to accept a laser optic. And with some lasers, like the guide rod laser from LaserMax, nothing changes about the outside of the pistol, allowing you to use holsters that are fitted to the gun only. "Just as during any life threatening situation, the human body reacts in a vastly different manner than 'normal'," Thomas said. "As adrenaline screams through the brain and body, your vision narrows and there's no such thing as 'autopilot.' Having a bright, aiming point on your target is the insurance policy your body needs when it's no longer in control." One of the great advantages of having a laser mounted on your firearm is that it simplifies to shooting process. High-stress situations can limit the body's ability to perform complex tasks, and that's when the simplicity of a laser becomes a major advantage. Learning to survive a deadly encounter is as much a mental challenge as it is physical. You need to be prepared to react in the event that you are attacked and perform. With proper training, it's possible to manage stress, but lasers make firing under duress easier. "In a life-threatening situation a lot of things can happen — and clear thinking is normally not-existent when adrenaline is flowing and the heart rate goes up," says Faw. "Toss in darkness and difficulty seeing, and this is the condition when a laser sight shines and helps you succeed and live to see another day."